Horseball was invented in the 1970s, featuring men and women playing 20-minute matches in mixed teams of six. But who are the world's best teams? Britain was introduced to horseball in the 1990s but, like the England football team, has not yet lived up to expectations on the international scene. The French created the sport to build confidence in riders. Horseball players must master the art of swooping low to collect the ball from the floor. As horseball's inventor, France has been dominant for decades, but Spain and Belgium are increasingly strong. While 80% of current players are French, horseball is a growing sport. Algeria, China, Kyrgyzstan and Mexico are among its member nations. 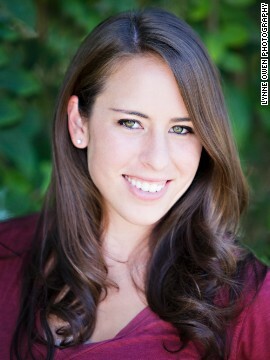 (CNN) -- Out with seekers and brooms. In with stirrups and hooves. This is horseball, where rugby meets basketball on horseback -- but players have more fun comparing it to quidditch, the sport of Harry Potter's wizarding world. 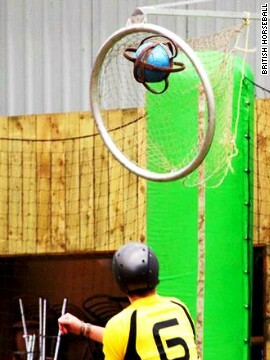 "I usually ask people if they've seen the Harry Potter movies," says British horseball player Jamie Gibson. "Quidditch is the nearest comparison I can think of. That usually gets people going." While Potter and teammates pick up gruesome injuries with disturbing ease playing quidditch, full-contact horseball does at least feature helmets. 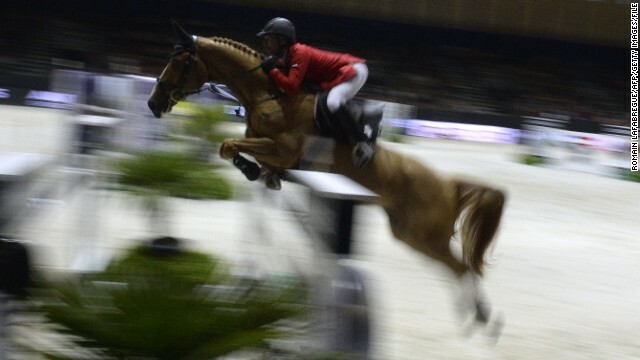 "It looks a little bit violent, but it isn't," says Frederico Cannas, the sport's president, who began playing as a teenager in his native Portugal. 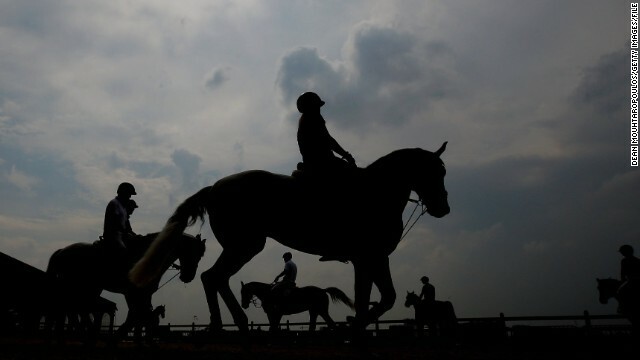 "The horses are very well-prepared and there are rules to protect both the horse and the rider. It's intensive, but it's safe." As UK horseball pioneer Jim Copeland puts it: "People have a go at you, that you 'shouldn't be doing that with an animal,' but we only have one horse -- so we want to end up with it at the end of the game, in the condition it started in." Horseball games last 20 minutes, in which teams of six -- four horses per side at any one time -- try to shoot a junior football with leather handles into an oversized basketball net. At the highest level, you can expect up to 20 goals per game. Players can tackle each other, so horses and riders do come into contact, and one of the game's signature moves involves riders swooping low to pluck the ball off the ground, without dismounting. 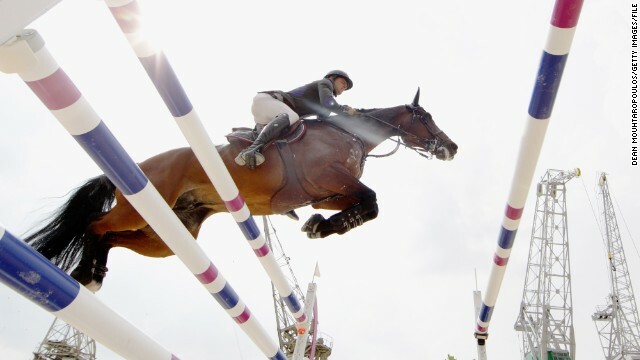 That requires the game's only specialist riding equipment, a "pickup strap" which ties the stirrups together, allowing competitors to lean far below their horse, collecting the ball without falling off. 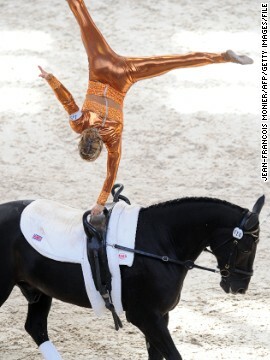 Joanne Eccles on her way to victory at the 2012 FEI World Vaulting Championship in France, competing on her family's horse W.H. Bentley. Eccles also competed in the "pas de deux" pairs discipline with her younger sister Hannah at the same event in Yvre-L'Eveque. Their father John -- pictured right -- serves as Joanne's lunger, directing the horse from the center of the circle while his daughter competes on its back. 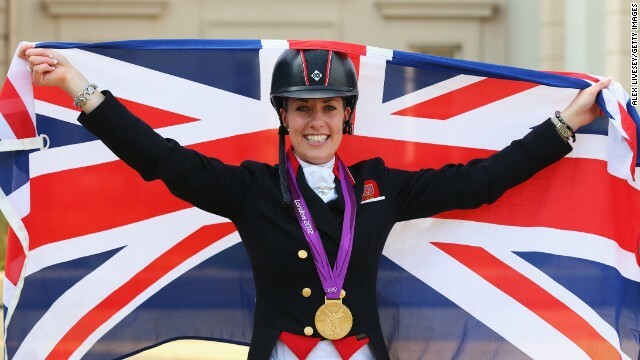 The British equestrian rider won her first vaulting world title in 2010, also on W.H. Bentley. 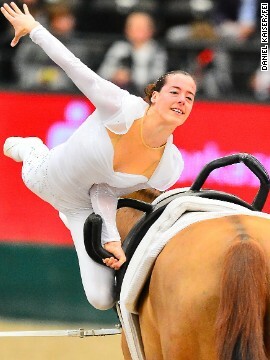 Italy's Anna Cavallaro, seen competing at a vaulting World Cup in the German city of Leipzig, is expected to challenge Eccles for world gold this year. 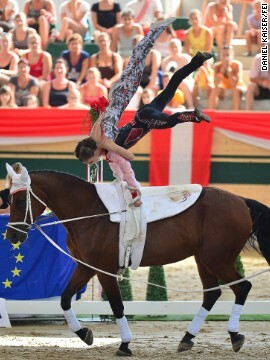 Germany has long been the world's leading vaulting nation. 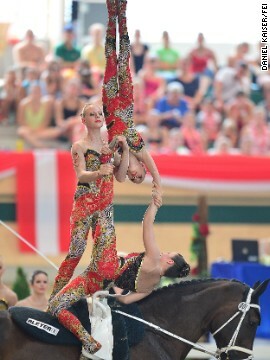 In 2013 the Germans won the European team event, which involves six vaulters, up to three of whom may touch the horse at any moment. 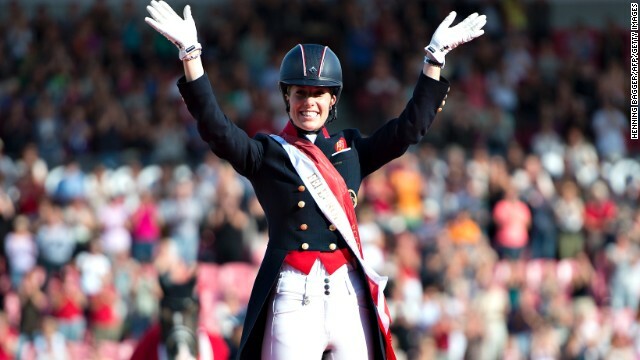 In 2006, U.S. rider Megan Benjamin became the first non-German in vaulting history to win women's gold at the World Equestrian Games. Benjamin performs a split leap. 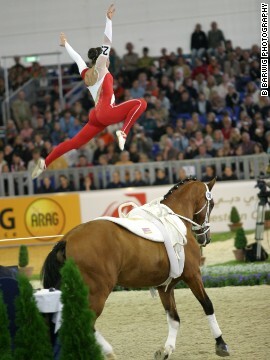 Vaulting's trickiest move may be the shoot-up mount, where the vaulter springs onto the horse while facing its tail, using a combined backflip and reverse-handstand motion. Benjamin retired from vaulting in 2012. 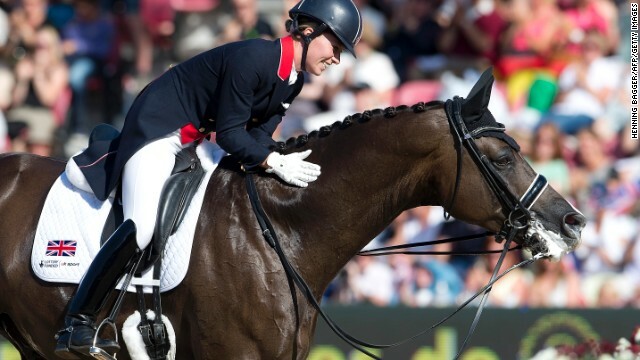 Her relieved mother says there will be "no stress" watching August's World Equestrian Games in Normandy, France. Male vaulters are in short supply in some nations, though France has a strong men's team. Jacques Ferrari, pictured, won European gold last year. As well as individual and team contests, the pas de deux allows a pair of vaulters to compete at the same time. Austria, pictured, won the 2013 European title with this performance. 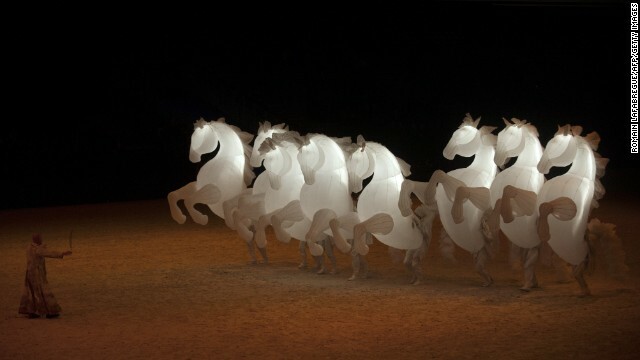 The 'Carrousel des Fiers' show is performed as part of the opening ceremony for the FEI World Cup jumping and dressage finals in Chassieu, France last month. 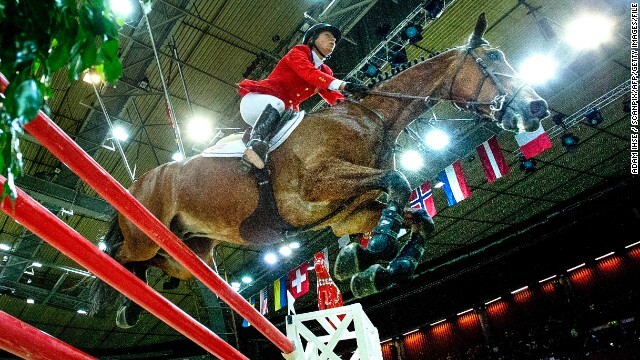 Beezie Madden of the U.S. and her horse Simon ride to glory at the FEI World Cup jumping final at the Gothenburg Horse Show in Sweden in April 2013. 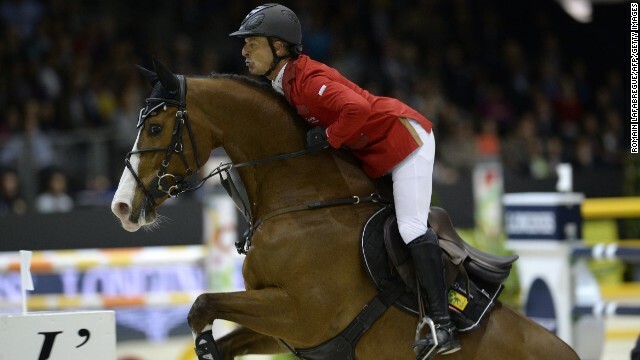 Germany's Marcus Ehning and horse Sabrina compete at the Global Champions Tour of Antwerp in Belgium in April. 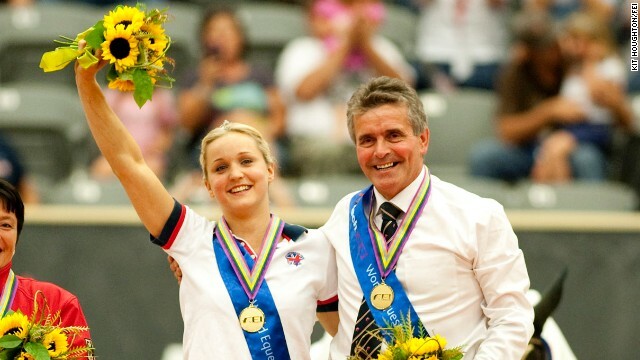 Pius Schwizer of Switzerland along with horse Quidam du Vivier claimed victory in the jumping final at the FEI World Cup jumping and dressage finals held in Chassieu, France in April. Schwizer competes on horse Toulago during the jumping final at the FEI World Cup jumping and dressage finals in Chassieu, France. 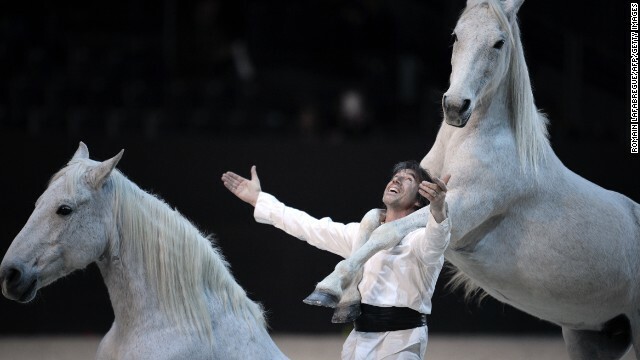 French horse trainer Jean Francois Pignon performs with horses at the opening ceremony for the FEI World Cup jumping and dressage finals in Chassieu, France. Frederic Vernaet of Belgium and his horse Voice de Longchamps compete at the Global Champions Tour of Antwerp in Belgium in April. Riders and their horses warm up in the paddock during the Global Champions Tour of Antwerp in Belgium. "That's our little secret," laughs Cannas. "For spectators, it looks fantastic when players do that, but for people picking up the ball, it's not that difficult." 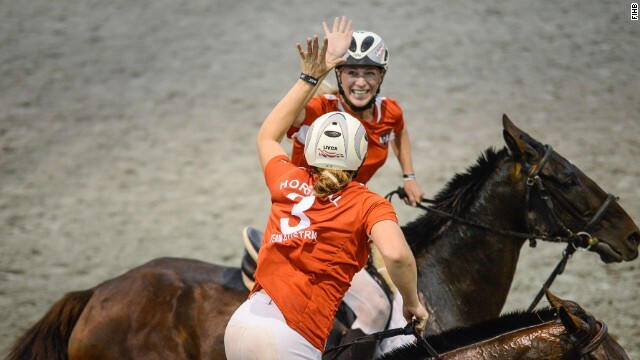 The sport's passing, movement and some strategies share similarities with rugby and basketball, but horseball first appeared in 1970s France as a descendant of pato, Argentina's national game. Pato is centuries old and looks more like polo -- early players once used a duck in a basket as the "ball" -- whereas horseballers say their sport offers a more modern, spectator-friendly experience. 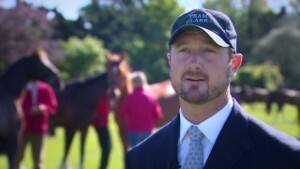 "I believe this is one of the most exciting equestrian sports," says Cannas. 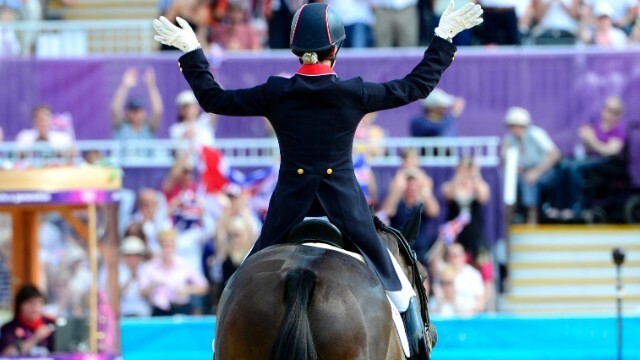 "It's a team sport, when equestrian sports tend to be individual sports, and the gear is not expensive. "To start horseball, you don't have to have a lot of riding skills. You just have to be comfortable on a horse." Copeland, who founded the North London club in the 1990s, adds: "It's the team aspect. 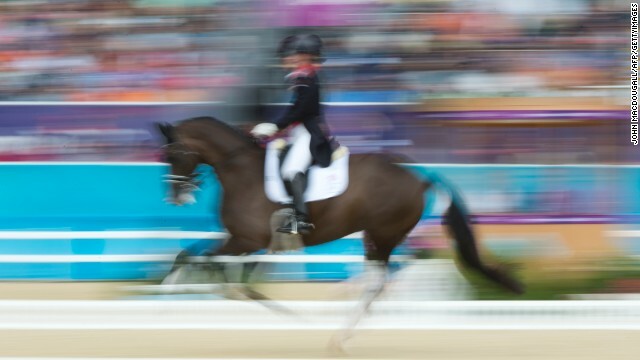 In the other equestrian sports, like dressage and jumping, the team event just means you're relying on each other for points. "In horseball, you rely on each other the same way you would in a football match. 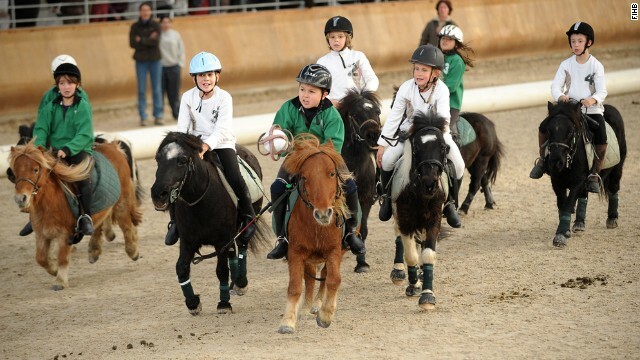 "Horseball encourages men and boys to stay riding longer. The participation is about 50-50, men and women." Gibson, who works at a nuclear power station when not playing, is testament to that. He says horseball kept him riding as a teenager. "I was about 14, and I was leaning more towards football and rugby," he recalls. "But my uncle had a space on his horseball team and I didn't really look back. It kept me involved in horses. "On the team this year there's me, two of my sisters, another lad that's played for about 15 years, and two girls who used to play for Nottingham -- one is a doctor and the other is an accountant." 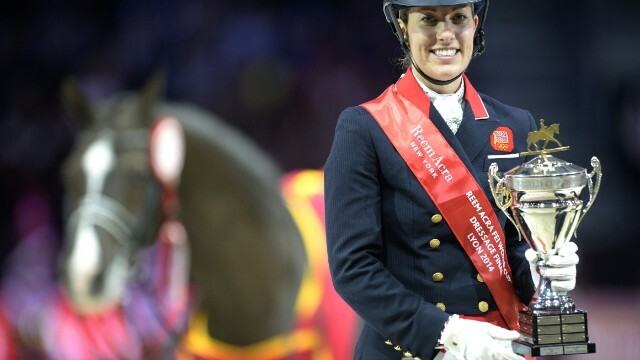 Cannas says more than 80% of the world's players hail from France, while Copeland was inspired to start horseball in the UK when he saw a French demonstration at the 1991 Horse of the Year Show. 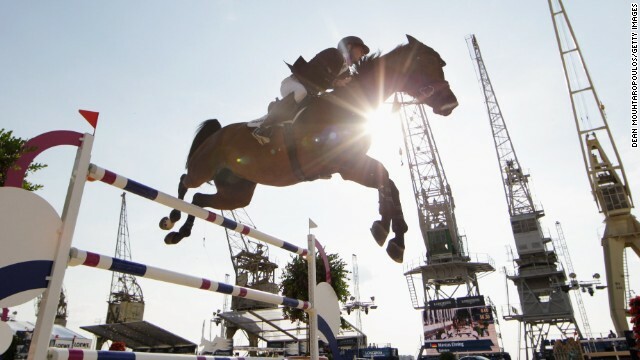 But Cannas believes his sport can expand quickly in years to come, beginning with a chance to showcase horseball as a demonstration sport at this August's World Equestrian Games in Normandy. "We now have 18 countries playing horseball," says Cannas. "We have already had two World Cups, there is a Champions League, and there are some national championships. 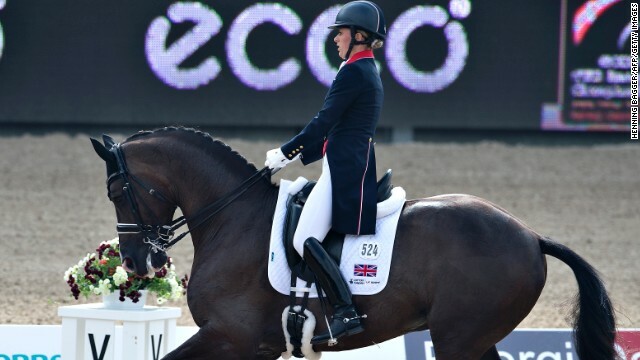 "I believe, in five to 10 years, this will be one of the biggest equestrian sports. People love it. Last month I was at an equine fair in Ohio and they were crazy for horseball, it was basketball on horseback. "We even have horseball in Australia at the moment," he adds, "but they are on the other side of the world, and sometimes they try to do their own thing." That makes Copeland chuckle. "The Australians can be quite ... physical. When they go to international competitions, they find they haven't really read the rules properly." Horseball's next move is expansion into the United States. The players, however, have bigger dreams. "They say that if Paris had got the 2012 Olympics, instead of London, horseball would have been looked at as an Olympic event," says Gibson. 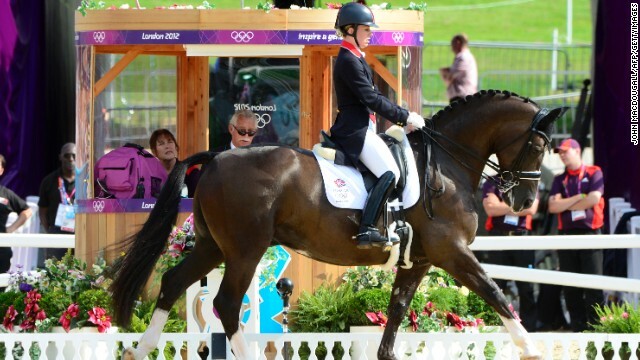 "I was one of the few who was slightly disappointed when London got the Olympics." Copeland adds: "Personally, I think this would make an excellent Olympic sport. "Whereas the horse world is always very good at attracting its own, horseball attracts people who aren't even interested in horses."